As teachers we are ‘always learning’ but there are times when we need to just draw the line and do other things. Sadly, Sally is not the only one who thinks this is a good idea. Some even call it “micro-PD” and actively promote ‘bathroom readership‘. This opened up a ‘debate’ and a few folks have sounded off, me included. My gut reaction to this is simple: toilet time is ‘me’ time and I need to focus on what I’m doing. I don’t want to read about the effects of bilingualism on functional and structural adaptations of the brain or a summary of a report on mathematics anxiety from the University of Cambridge’s Centre for Neuroscience in Education. It might very well be important stuff and I could well be missing out but I am otherwise engaged concentrating on the business in hand. I won’t stand for it and I won’t sit down for it either. No one wants to see a ‘12 Educational Research Myths‘ strategically placed at eye-level whilst getting in touch with nature. And Mr Yamazaki might very well be doing amazing things with his ‘Hitaisho’ teaching method in a rural Cornish primary school but I’m busy doing other things. He can wait. 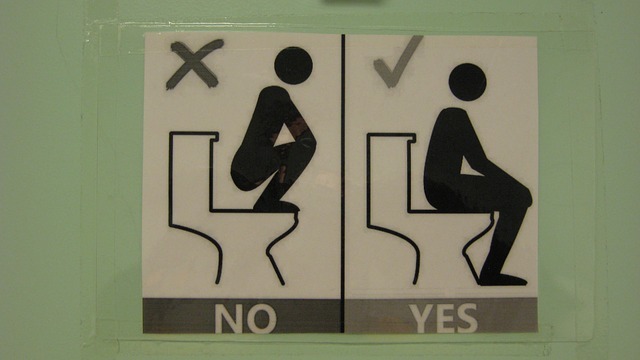 Do your staff need toilet training? If you are desperate for CPD then dumping it in the toilets isn’t the best way to go. What next? Shall we sit on our thrones, take the strain and discuss the effect size of mindfulness with neighbouring cubicles? Actually, this could be a great chance to share the moment and coach or mentor colleagues. Let’s make it a drop-in staff meeting. We could also bring in some marking and do that because we are, after all, extreme multi-taskers. There’s not a second to waste even when dealing with your waste. Holy crap, what has teaching come to when potty colleagues are squeezing professional development into what should be sacred protected time? What you do in the loo is your business and we don’t need CPD shoving in our faces at the point of relief. We don’t need to loiter in the loos – just get in and get out. We can trumpet vigorously about CPD but not in the thunderbox thank you very much. I doubt other professions are hitting the khazi for some closet CPD. Learning on the loo just stinks. Okay, okay teachers are locked in a teachery mindset 24/7 but is it any wonder if the privy is an extension of the staffroom? We don’t get a minute to ourselves and visiting the ‘restroom’ should allows us some uninterrupted time to do what we need to do. I don’t need plumbing into the latest strategies when I’m taking a comfort break and I couldn’t give a flying plop about hinge-point questions when getting myself together. CPD is important and it can happen in lots of places but really, the bogs are really just for one or two things only so let’s leave it that way. Toilet CPD will do your wellbeing no good whatsoever so flush whatever you see attached to the walls and doors down the pan and don’t forget to wash your hands. You’ll leave with a clean conscience and feel better for it. You’ve got the right to go and the right to say no. Different people have different toilet habits but saying no to CPD in the powder room trumps all opposition on wellbeing grounds. Learning on the Loo is toxic CPD so please turn on the extractor fan and get rid. It’s a wind of change we don’t need, a bit like those that jump on the ‘Car Share’ bandwagon and offer CPD whilst they are driving to school and some crashing en route – another blow out. If you want to stick anything up for people to read then how about the Bristol stool chart (always aim for a ‘number 3’) and a poster on the correct handwashing technique. We don’t need to see WC replaced by CPD and I don’t need toilet training. CPD loo paper could work though so let’s be open to that. I’d give it five minutes if I were you. Motion carried. ‘Learning on the Loo’ is a bum idea. It’s bad enough that a photo of our DSL is on the back of each cubicle door….let alone anything else!